Learning to play Mandolin should be fun and easy! If you're picking up the mandolin for the first time, here's the answer! A course will lead you by the hand through all of the preliminaries of basic mandolin technique leading you up to an intermediate/advanced level. Learn all about chording, rhythm, scales and playing leads.This course focuses on good form such as proper left and right-hand techniques that establish proper technique. Learn good habits from the start...which will make you a better mandolinist in the future. Don't limit your playing capabilities by acquiring poor habits that are difficult to shake at a later stage. Proper Left-Hand Positioning Proper Right-Hand Positioning Flat picking Direction The Many Ways to Tune Your Mandolin Tuning Tools Learning Your First Melodies Exercises to Build Solid Technique Many Melodies to Further Technique Overview exercises and melodies. All basic Chord positions within the four most common keys of G, C, D and A are visually presented. Upon learning these chords, you'll learn to combine these easy chord positions to rhythm techniques of your picking hand. How to strum in time so that you're better able to play back-up to vocalists and other lead instrument players. This rhythm technique will also assist you with your timing so that you're better able to play melodies. Most of these chords only require two fingers to play...and with your mandolin properly tuned, which is taught in earlier chapters, you will find yourself sounding like a pro simply strumming these chords in time. Additionally, this institute introduces exercises that make the learning process far less frustrating. By the time you've accomplished the exercises, melodies become far easier to tackle. Basic exercises and advanced exercises are introduced throughout the course establishing a strong foundation for learning many other melodies on your own. A methodology approach focuses on building technique first and playing melodies later. Learn the basic building blocks of playing before attempting to play over your head. You'll find the learning process fun and easy if approached by this stair-step process. Additionally, a methodology approach focuses on technique so that you've gained proper facility as you grow into an accomplished master of the mandolin. 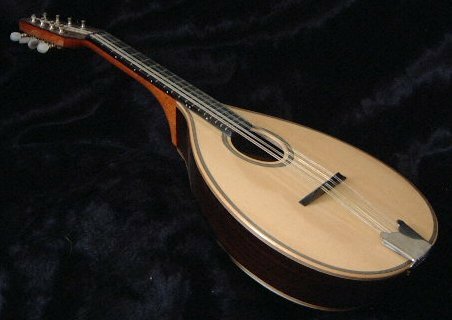 If you're seriously considering taking up the mandolin, but are not completely sure, this music institute is a great introduction ... it reveals the many possibilities of what a mandolin can do ... Many think of the mandolin as a Bluegrass instrument, and the mandolin truly does serve well within Bluegrass settings. However, the mandolin can also serve well within most any style of music including: rock, jazz, country, ragtime, blues, and anything else you can think of, and, with this institue, you'll be laying the foundation to tackle any style of music you'd like.